The thesis/creative project provides an opportunity for professional and scholarly challenges beyond the classroom for students in the advertising/public relations, broadcasting or journalism majors. 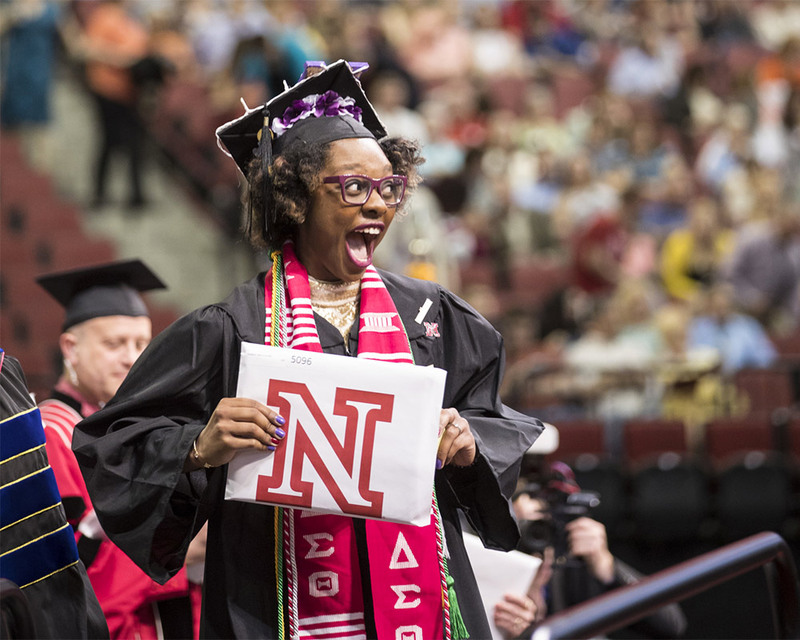 Students wishing to complete a thesis/creative project must have earned at least a cumulative GPA of 3.7 or they must be in the University of Nebraska–Lincoln Honors Program. Honors students should contact the Honors Program Office to learn about additional requirements. Students should begin making arrangements for the honors thesis/creative project before they complete 89 credit hours by consulting their academic advisors and by asking a faculty member to serve as thesis/creative project advisor. (The advisor must be a faculty member in the College of Journalism and Mass Communications.) Students should ask at least two faculty members to serve on their honors thesis/creative project committee. Deadlines for the various stages of the project appear at the end of this section. Students must register for a total of at least three credit hours over the course of two semesters to qualify for college honors. Usually students register for one hour of credit during the first semester and two hours in the next. Before registering for the first hour of credit, students need to complete a topic approval form (attached) and obtain their thesis/creative project advisor’s signature of approval. When this is complete, the thesis/creative project advisor will give the students the number to enroll in the course. During the first semester the student should register for 499H in his or her major for one credit hour and proceed to develop a proposal for the thesis/creative project. By the middle of the first semester, the student should submit a thesis/creative project proposal and a completed proposal approval form, which is available in the college’s main office. It should be signed by the faculty committee and given to the dean’s office staff. Staff members will give a copy of the proposal and the signed approval form to the student, the thesis/creative project advisor and the college’s chief academic advisor. The process culminates with an oral exam covering the contents of the thesis/creative project. The oral exam must be completed five weeks prior to graduation (by April 5 for May graduates, July 10 for August graduates or November 15 for December graduates). The oral examination must be announced a week before the defense in a memo circulated among the faculty by the thesis/creative project advisor. The announcement should indicate the time, date and place of the orals as well as the topic of the student’s paper. After the oral defense, the committee must give a copy of the oral defense form to the chief academic advisor, recommending a level of distinction at which the student should graduate. The advisor will forward the information to Registration and Records. Students should provide an unbound copy of the finished thesis/creative project to the staff in the main office. Students also should make bound copies of the final draft for all faculty members on their committee. Theses and faculty evaluations of theses are due in Andersen 147 on the following deadline dates: April 5, July 10, November15. The forms for making the reports are available in Andersen 147 or download and print. The college is open to considering a wide variety of topics and ideas for theses and projects. For example, a student may combine an interest in an aspect of journalism or mass communication with one or more additional fields. The topic may be primarily academic (a thesis) or primarily journalistic or creative in nature (a project). CoJMC and the University Honors Program encourage creative topics and presentations. The advisor and the other committee member/s are expected to assure that the topic is appropriate for a thesis/creative project in this college and that the final product reflects careful research, planning and excellent execution. A Media Conglomerate’s Conflict of Interest: Does Time Give Better Reviews to Time Warner Films? Usually the thesis/creative project process begins with a conversation. Please contact your advisor to arrange an appointment to discuss possible thesis/creative project topics. In recognition of academic excellence, the college recommends the bachelor’s degree with distinction, with high distinction and with highest distinction. To be recommended, candidates must fulfill the specific criteria as described below, in addition to meeting all the general criteria and procedures applicable to all distinction classifications. The thesis/creative project and results of the examination over the thesis/creative project in each instance must be acceptable to the advisory committee. Highest Distinction. Candidates for the bachelor’s degree may be recommended for degrees with highest distinction on the basis of the following criteria: scholastic standing within the top five percent of the graduating class of the college in the preceding 12-month period AND the advisory committee’s recommendation based upon a thesis/creative project or comparable creative effort and an oral examination over that thesis/creative project. High Distinction. Candidates for the bachelor’s degree may be recommended for degrees with high distinction by fulfilling one of two sets of criteria: 1) scholastic standing within the top five percent of the graduating class of the college in the preceding 12-month period; or 2) scholastic standing within the top 10 percent of the graduating class of the college in the preceding 12-month period AND a recommendation by the advisory committee based on a thesis/creative project and an oral examination over that thesis/creative project. Distinction. Candidates for the bachelor’s degree maybe recommended for degrees with distinction by achieving one of two sets of criteria: 1) scholastic standing within the top 10 percent of the graduating class of the college in the preceding 12-month period; or 2) scholastic standing within the top 15 percent of the graduating class (never below a 3.7 GPA) of the college for the preceding 12-month period AND a recommendation by the college’s advisory committee based upon a thesis/creative project and an oral examination over that thesis/creative project. Ordinarily, only students who have taken their last 48 hours of course work in residence will be considered for degrees with distinction. In considering individual cases, the College Advisory Committee will review both grades and the program of courses. Students who choose one of the thesis/creative project options described above should make arrangements before their senior year by consulting with their academic advisors. Specific guidelines for a thesis/creative project are available in the college main office and online at journalism.unl.edu/honors. *Check availability of your committee, as many faculty are not available during the summer.